But it is “Fat” Stretch Tuesday today! Russell and Kitty here. So what does Valentine’s Day have to do with big vases? They are waiting to be filled with beautiful flowers tomorrow. So why do we have big vases better known as funeral vases by collectors? They were used in funeral homes to hold big bunches of flowers. 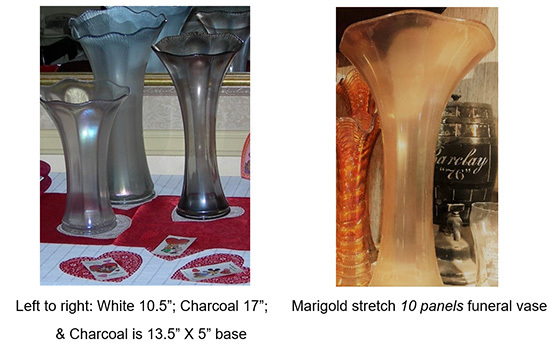 By the way, carnival and stretch glass collectors both consider as a definition of funeral vases a base of 5” or more. Some funeral vases are squatty and some are pulled way out according to what the glass craft person wanted to do. We have already established that for a vase to be a funeral vase the base needs to be at least five inches across. 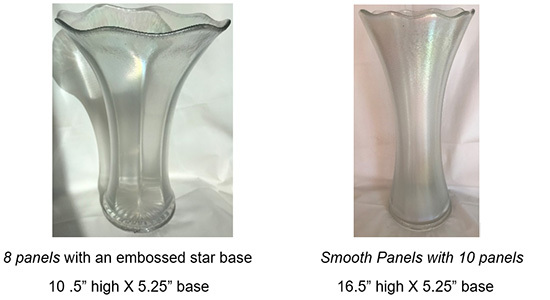 Diamond has a vase that is listed in John Madely and Dave Shelter’s book “American Iridescent Stretch Glass” page 34, plate 91, one straight sided vase with a 5” base. Looked through David Doty’s “Field Guide to Carnival Glass 2015″ and did not find any funeral vases made by Dugan nor Diamond. Does anyone else know of any funeral vases made by Dugan or Diamond in carnival or stretch glass? Fenton made a number of large vases, but no stretch glass funeral vases that have 5” or larger base. 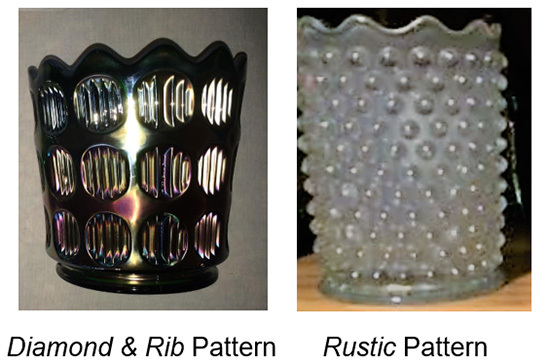 In carnival glass, they made Diamond & Rib and the Rustic patterns. 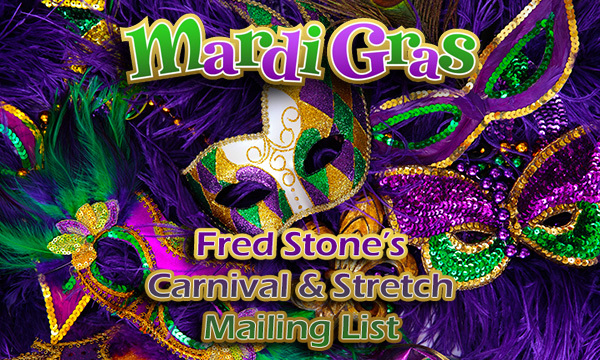 Bill Edwards and Mike Carwile in the “Standard Encyclopedia of Carnival Glass 9th Edition” lists Rustic and the Rustic Variants funeral vases. Most of the above Imperial Stretch Glass Funeral Vases shown above David Doty in his New “Field Guide of Carnival Glass 2015″ lumps the vases into the pattern name of Smooth Panels by Imperial. The shorter funeral vases have 8 panels and the larger funeral vases have 10 panels. So some collectors call them 8 panel vases and 10 panel vases. As to the colors, Imperial lists “Iris Ice” as the crystal (white); “Blue Ice” is charcoal; “Rose Ice” is marigold; “Green Ice” is teal. They didn’t really have a color name for their amberina. 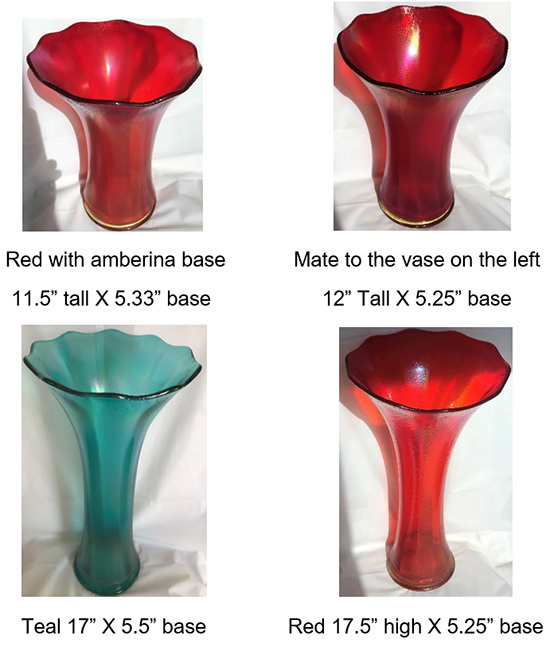 99% of the red Imperial glass is actually amberina. The vases shown are all a beautiful what may call a cherry red (bright clear red) with yellow in the base of the vase so it technicality is amberina. In carnival glass, Imperial made the Morning Glory and the Ripple Funeral Vases. Northwood made one stretch glass funeral vase that we have found. 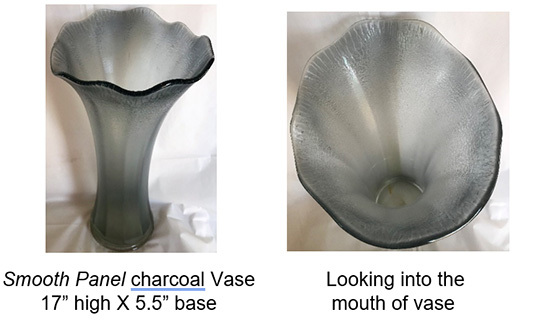 #930 – 15” swung vase is how it is listed in a salesman’s flyer. This vase can be found in blue (similar to celeste blue) and a medium green (an unusual color for Northwood’s Rainbow Line [stretch glass]). The medium green is very close to Fenton’s Florentine Green. In carnival glass, they made the famous Tree Trunk and Edwards and Carwile differentiate between the Tree Trunk and the Tree Trunk Variant funeral vases. Really thought that there were more patterns of funeral vases in both stretch glass and carnival glass. Have measured every large vase that we have as well as gone through most of our research books on iridescent glass. What funeral vase (base is larger than 5”) patterns have we missed? Carnival or stretch glass? 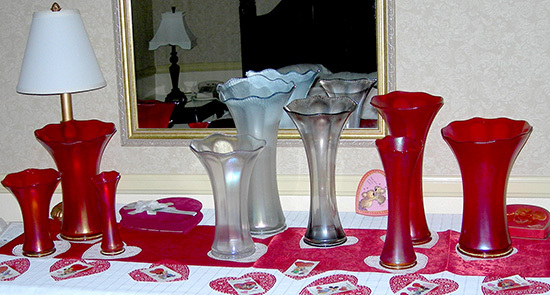 There are some vase bases that are very close to five inches, but tried to stick to the 5” or larger definition set by carnival glass authors. We are continually asked about how do you display your funeral vases. Answer is any place where they fit that is off the floor so the dogs can’t bump into them! Just a word of caution so hopefully you won’t spoil Valentine’s Day. Do not fill your funeral vase with ice cold water as I did without thinking! If you do, the “ping” fairy will probably visit you. 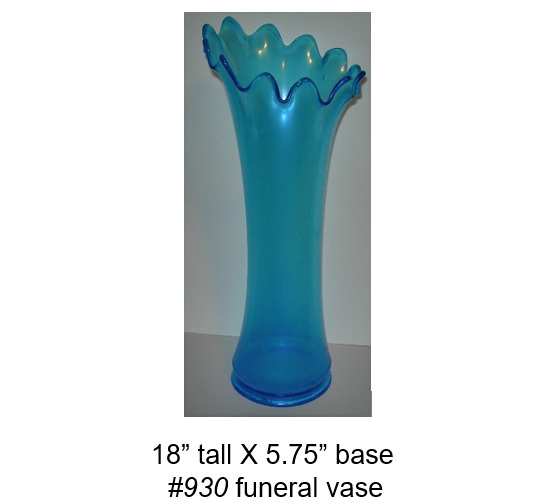 We have a huge 20” marigold Imperial stretch funeral vase that someday will be in two pieces. What we do now if we want to use the vase, we’ll put in a plastic soft container like a potato salad container in which to put the cool (not ice) water and the flowers into. Artificial flowers are not romantic, but they do last longer. Plus they do not require water so you don’t have to worry about the “ping” fairy!